In a country known for playing golf even in the worst of conditions, fierce wind prompted British Open officials to temporarily stop play on Friday. South Africa's Louis Oosthuizen, meanwhile, surged to a five-stroke lead, watching from the comfort of his hotel as first-round leader Rory McIlroy stumbled in the blustery conditions. Despite sunny skies mixed with puffy white clouds, officials decided the Old Course was unplayable because the wind was gusting to 41 mph, causing balls to wobble on some of the exposed greens, especially those along St. Andrews Bay. Second-round play was suspended 1 hour, 5 minutes at midafternoon, shortly after Phil Mickelson finished his round in brutally tough conditions and Tiger Woods had teed off. The last wind delay at the British Open was at Royal Birkdale in 1998, when gusts reached 40 mph, forcing a 38-minute stoppage during the second round. During Friday's break, players returned to their lounge near the first tee to wait for conditions to calm. Caddies sprawled on a grassy knoll, munching on sandwiches and bananas. Some fans claimed a patch of ground and caught a nap. Oosthuizen, a 27-year-old from Mossel Bay whose given name is Lodewicus Theodorus, shot a 5-under 67 for a 12-under 132 at the midway point of the tournament. He was done before McIlroy teed off, hoping to put up another solid round after tying the major-championship record with a 63 on Thursday. The 21-year-old from Northern Ireland bogeyed four out of five holes on the front side and finished the round with an 8-over 80, leaving him 11 strokes behind Oosthuizen. Mark Calcavecchia, trying to strike another blow for the senior circuit, was closest to Oosthuizen among those in the clubhouse. The 50-year-old American shot a 67 that left him at 137, with Lee Westwood and Paul Casey another shot behind. Woods was just trying to hold on in wind that was gusting more than 30 mph even after play resumed. He bogeyed the first two holes, but a fortunate break at the par-5 fifth helped him pick up his first birdie of the day. But two more bogeys on the back nine left Woods 4 under for the tournament. The weather made it a typical British Open roller-coaster of a day. The early starters found blue skies when they arrived, but heavy rains rolled in shortly after the start of the round. The sun peeked through the clouds again, then more showers struck just before noon. The players, it seemed, spent as much time reaching for their umbrellas and rain gear as they did for their clubs. "I got up this morning and it wasn't looking real pretty at 4:30," said Calcavecchia, who played in the first group. "It was actually beautiful when we teed off. Then we saw a little bit of everything." Oosthuizen wasn't worried about any of that, and he was already done when the wind started to blow around lunchtime. "I'm very confident with the way I'm playing," he said. "It's probably the position anyone wants to be in playing a major on the weekend, and I think it's what we work to achieve, and I'm just very happy with the two rounds I put together." There was nothing to indicate he might contend at golf's oldest major championship. He missed the cut this year at the Masters and the U.S. Open, and did the same at last week's Scottish Open. This is only the second time he'll make the cut in nine major appearances. The other time, at the 2008 PGA Championship at Oakland Hills, he finished last among those playing on the weekend. But he did claim his first win on the European Tour this year, earning a spot at Augusta National. With the wind at his back, Oosthuizen went with shorter clubs off the tee to keep the dreaded pot bunkers out of play. He got a bit wild on the back nine, starting out birdie-bogey-birdie-bogey-birdie before he settled down with a couple of pars and a 15-foot birdie at the final hole to leave him with a good feeling going to a weekend that will be like none he's ever experienced before. Oosthuizen strung together three birdies in a row beginning at the par-5 fifth, where a driver and a 4-iron left him with a chip that he left 5 feet from the flag. Maybe if he's walking up the 18th fairway with the claret jug in his grasp come Sunday, someone will break out the vuvuzelas, those South African horns that made the World Cup sound as though it was under attack from swarming bees. Until then, he said, leave 'em at home. "On the golf course? No, not on the golf course," Oosthuizen said. Westwood gave no indication that he's bothered by a ruptured muscle in his right calf. The world's No. 3 player, generally recognized as the best player without a major title, followed an opening 67 with a solid 71. Casey managed a 69 despite a triple-bogey at No. 17, the famed "Road Hole." A drive into the thick rough left of the fairway led to big trouble; even aiming sideways, he needed two whacks to get out, then he came up short on the approach and two putted for a 7. Calcavecchia? Nothing new about a senior holding lofty status at this event. The American will try to finish what was started by 53-year-old Greg Norman (the 54-hole leader in 2008) and 59-year-old Tom Watson (who had a potential winning putt on the 72nd hole last year). Both came up short of becoming the oldest major champion in golf history, a title that still belongs to Julius Boros, who was 48 when he captured the 1968 PGA. "You see a guy like Tom Watson last year, almost winning when he was almost 60, and you realize that it doesn't really matter how old you are," said Calcavecchia, relishing his best round ever at St. Andrews. "The old guys can hang with the young guys." Woods, trying to win his third straight Open at St. Andrews, opened with a 67 and hit a couple of shots before the suspension. Play was halted as he prepared to putt out for par. He returned more than an hour later - and missed. Mickelson, who made only one birdie in his opening round of 73, went out with hopes of getting back into the mix - or at least to avoid going home. He didn't make much of a charge, finishing with a 71, but that was likely to be good enough to at least get him to the weekend. But his sense of timing at this Open was terrible. 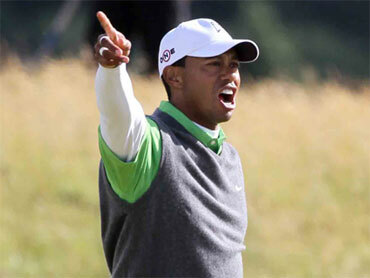 He played Thursday with a more unfavorable afternoon tee time, and caught the worst of the wind before the suspension. "It's very difficult," Lefty said. "Every hole is a tough par in these conditions." Perhaps the biggest surprise of the opening round was 1995 Open winner John Daly, who pulled off a stunning 66 while wearing the flashiest outfit on the course: lavender paisley pants, pink shirt, sky blue sweater and turquoise cap. Daly didn't tone it down Friday, donning pink paisley pants, a lime green cap and a neon shirt as he got in six holes before play was halted. Like everyone else, he was just trying to survive in the wind, standing at 3 over through 14 holes.